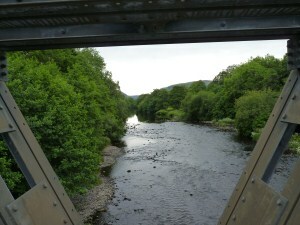 This is a circular walk which expores the triangular area between Elan, the Wye Valley, and Rhayader. It is a remarkably peaceful walk, especially compared to the walks on the Elan reservoirs close to the visitor centre. Grade: Moderate – Includes a gradual climb up for a view of the Cambrian mountains and then a slightly steeper and wetter descent. Park at the Elan Visitor Centre, and then walk back the way you came for about ¼ mile, then turn right and go across the metal bridge over the river. Turn left, and walk through the Elan village, until the road forks and you follow the right branch signposted to Llanwrthwl. Continue for a mile or so, and on your left you will see a house and just past it a rough track off to the left, which you should go along. 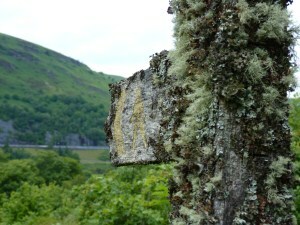 There is a signpost, but when we walked this was so covered in moss and lichen, we could just make out that it was supposed to indicate a bridle path. Follow this path and it will take you to a more upland area. Continue to follow the path until you reach a very definite fork, where you go left. This particular fork does not show on the OS map, but it takes you to a house and you continue past this for a few yards, until you meet a larger path (this shows up on the map as a public footpath) and here you go left downhill. After a short distance you will see that a bridle way goes through a gate on the left, you take this and follow the stream downhill. This section of the path appeared to be relatively unused, and was damp underfoot even in the middle of the summer, so we ended up walking along the edge of the fields on the right hand side where this was possible. Further down the hill you go through another gate, and take the path to the left. The stream stays on your left, and you carry on following this, until you reach a signpost just before the farm. Go left here, and cross over the stream on a little wooden bridge. Turn right along the top of the field, heading towards a lane. When you reach this, turn left, and turn left again when you come to an asphalted minor road. 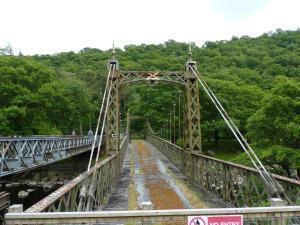 At the next junction you continue straight on, and this will take you over the Afon Elan bridge. You then turn left and follow the cycleway all the way back to the Visitor Centre. Although in the route I have mentioned roads, these are all very minor. In fact on the day we walked, we didn’t see a soul. The lower stretch of this walk was through woods, and the most striking feature was the number of young oak trees. Not just the number, but how strikingly healthy and green they were. 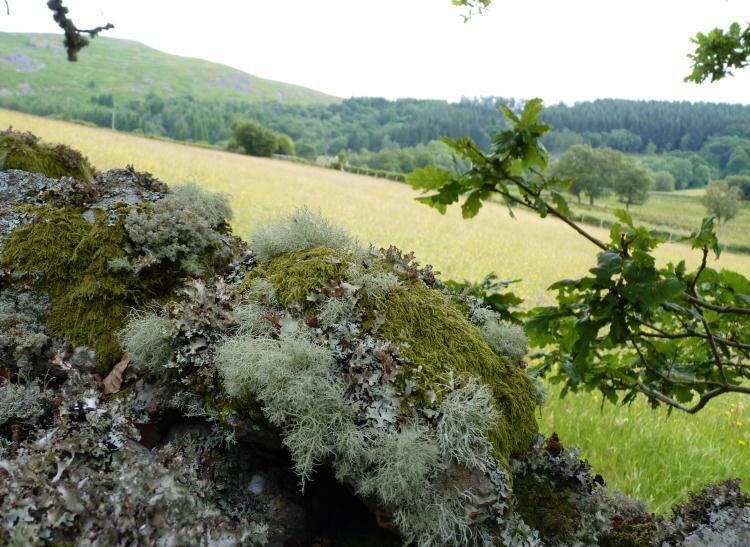 I don’t think it was just because we’d had some rain, there must be some combination of conditions that makes this area ideal for oak growth. The verdant feel was enhanced by the under layers of vigorous blueberries – and the always rampant bracken. 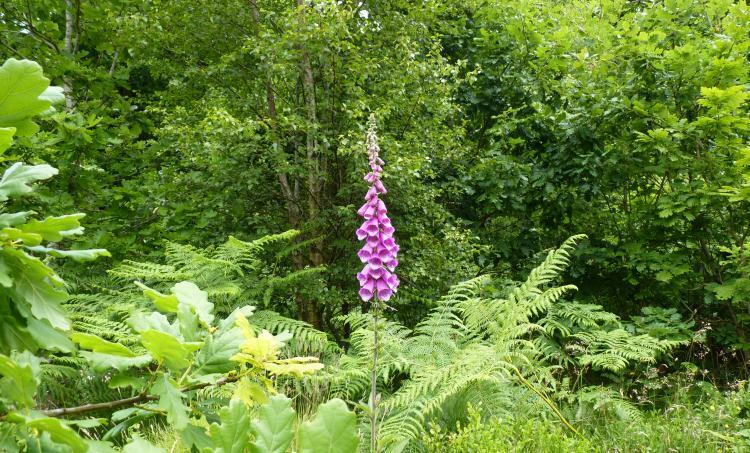 Foxgloves and wild garlic were taking advantage of any gaps left by the blueberries and bracken. Further up the landscape was dominated by gorse and heather (and bracken of course), with some lovely views of the surrounding hills. 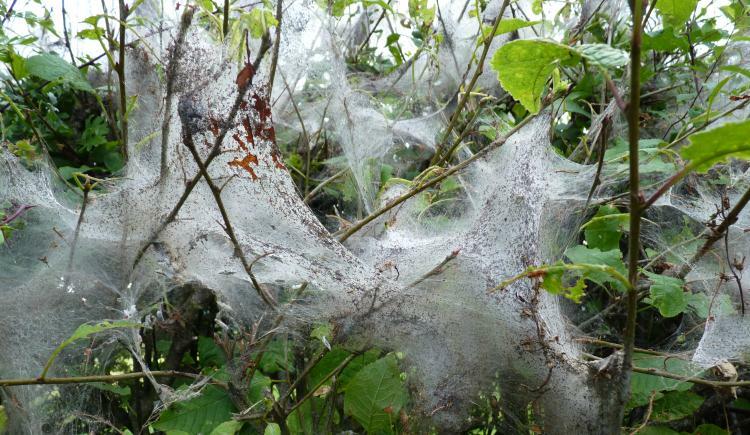 Returning along a lane, in the hedgerows we noticed masses of webs with white cocoons hanging in their midst – like Chrismas decorations covered by white candyfloss. I think that these were the webs and pupae of ermine moths…………………?